Unplannedhad a good — in fact, surprisingly successful — first weekend. The movie shows the reality of abortion as it tells the true story of Abby Johnson, a Planned Parenthood clinic director turned pro-life advocate. The pro-life movie made 6.1 million in box office sales this weekend. That’s more than double what movie industry forecasters were projecting. Unplanned tweeted that they’re seeing theaters sell out. What’s more, they’re planning to add 700 new theaters this week. Opening weekend came with some headache too, as Unplanned saw its official Twitter account suspended, then reinstated after an outcry. 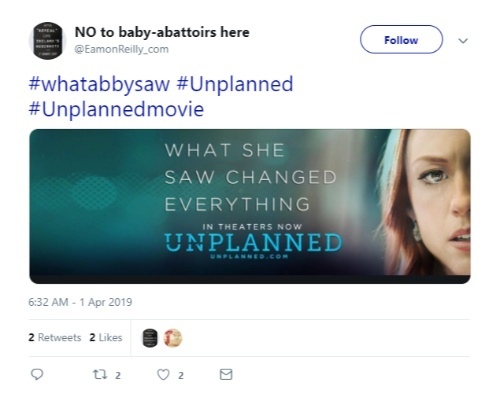 Twitter notified @UnplannedMovie that it would take about an hour for their follower numbers to repopulate. But “an hour or so” wasn’t the case. Users reported trouble following the account. 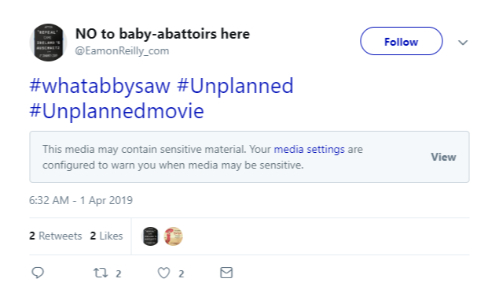 By Monday morning Abby Johnson tweeted that she couldn’t follow her own movie. Many users had reported the same thing: As soon as they refreshed the page, their following status was back to not following. Some posted videos of this happening. What is going on @jack? This is outrageous. Verify #UnPlanned! Censorship should be banned! So what’s the official Twitter explanation for all of this? The spokesperson declined to explain what that other account was, which Unplanned was mistakenly connected with. Regardless of how the movie account is faring on Twitter, we can rejoice that it’s doing well in box offices, and impacting hearts with the reality of abortion and the truths of transformation and forgiveness. See here for Dr. Michael Brown’s piece “My Uncontrollable Sobbing While Watching Unplanned Scared My Wife” and his experience this weekend at a theater, called “ first experience seeing the movie and “So Much Evil, Mommy. Those Poor Babies.” this weekend.